dentists even after moving hundreds or thousands of miles away. Not surprisingly, rural patients travel farther for treatment than do urban residents. "Some patients will travel 30+ miles," wrote a rural dentist, "and then there is the fellow who comes twice a year from the Netherlands…"
Geographic location played a significant role, although perhaps not as dramatic as might have been expected. Urban and suburban dentists were more than twice as likely as rural dentists to report their average patient traveled les than five miles for treatment. 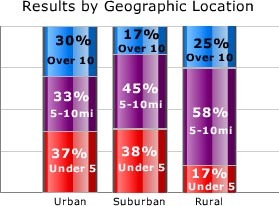 However, urban dentists were actually more likely than rural dentists to have patients travelling 10 miles or more. Note: Survey sample included 111 respondents.